The landmark AQUA-trial has now been published: the first independent randomised controlled trial (RCT) demonstrating that QbTest can increase the speed and efficiency of diagnostic decision making in ADHD. By incorporating QbTest into routine diagnostic assessment, clinicians were 44% faster in reaching a diagnostic decision and twice as likely to correctly exclude ADHD, significantly reducing diagnostic delay. In addition, clinicians were 77% more confident in their diagnosis and previously published data from the study showed that they also improved communication with their patients by using QbTest. According to the Principal Investigator Professor Chris Hollis “the results suggest that QbTest is ready for implementation within the ADHD assessment pathway in the UK, and in other countries with similarly long delays to diagnosis, where it is likely to lead to earlier diagnostic decisions and significant healthcare system efficiencies”. There is no gold-standard method for ADHD diagnosis, and the current recommended approach for ADHD diagnostic assessment relies heavily on parent, teacher and self-reports and clinical observations, putting pressure on a clinician’s time to obtain, interpret and integrate information. Given the subjective and often contradicting nature of these sources as well as the low completion and return rate of rating scales, there is little consistency in delivery of ADHD assessments and diagnosis. 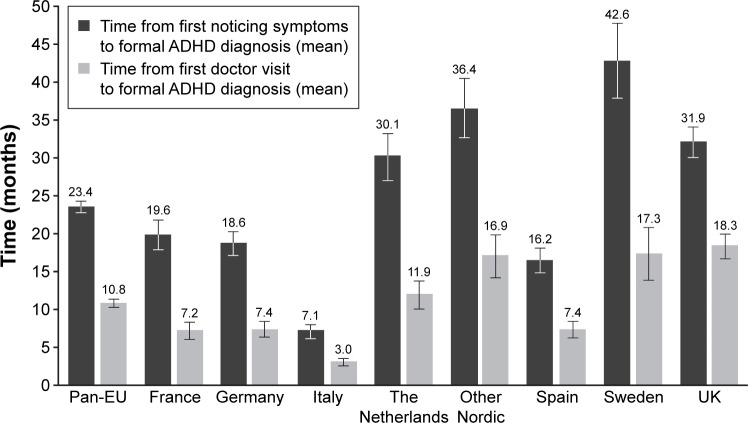 The assessment of ADHD is further complicated by the presence of co-occurring disorders, making differential diagnosis difﬁcult and increasing the number of clinic visits, likely resulting in substantial expenditure for health systems i.e. the NHS. The average time from first appointment to diagnosis is highly variable as found in Caregiver Perspective on Pediatric ADHD (CAPPA) survey, below. 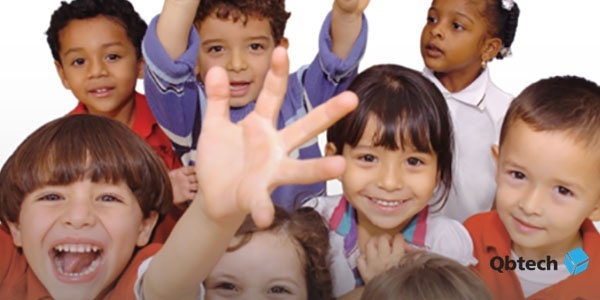 Early identification, diagnosis and interventions ameliorate the development of ADHD and reduce its long-term impact and adverse outcomes. So, there is an established need for clinicians to identify ADHD quickly when it is present and initiate effective interventions in a timely manner. The same applies to conﬁdently ruling out ADHD when the diagnosis is not supported, enabling clinicians to refer patients to more appropriate services more swiftly. Figure 1. Time to formal diagnosis. Notes: ANOVA F-test across countries, P<0.001 for both variables. Bars represent 95% confidence intervals. Abbreviations: ADHD, attention-deficit/hyperactivity disorder; ANOVA, analysis of variance. This April, the findings of the AQUA, ‘Assessing QbTest Utility in ADHD’, trial at the University of Nottingham have been published in the Journal of Child Psychology and Psychiatry, aimed at addressing these clinical necessities. The AQUA-trial is ground-breaking and unique of its kind: the first independent, parallel, single-blind multicentre RCT to evaluate the impact of an objective computerised assessment technology - QbTest - on diagnostic decision-making when added to routine clinical assessment of ADHD compared to assessment as usual. 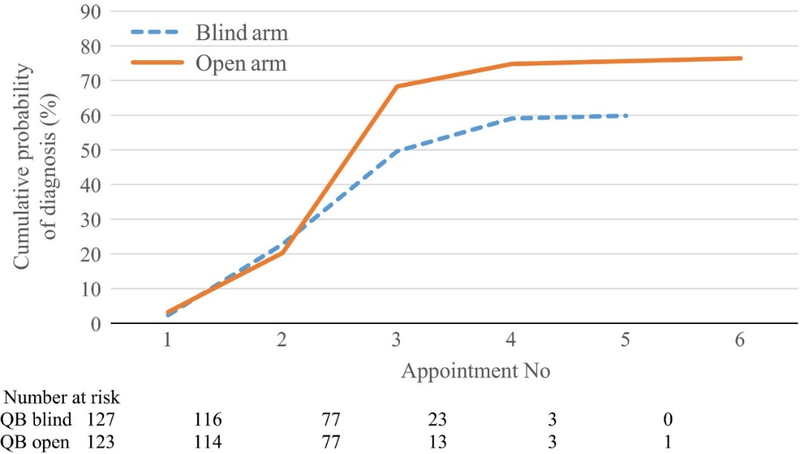 Figure 2 Primary outcome – Observed cumulative probability of confirmed diagnosis by appointment number with QbTest report withheld (QbBlind group) or QbTest report disclosed (QbOpen group). Note: Time between appointments may not be at a consistent interval. Number at risk is defined in survival analysis as the number of patients who have not yet had the event of interest (in this trial; a confirmed diagnostic decision) or dropped out at the beginning of each time interval. Supported by NIHR MindTech HealthTech Co-operative, the study was conducted in Child and Adolescent Mental Health Services (CAMHS) and Community Paediatric clinics across ten different NHS trusts in England and consisted of two arms: QbOpen (QbOpen) and QbBlind (QbBlind), determining if a clinician had access to the QbTest results as an addition to assessment as usual, typically involving a clinical interview and collection of rating scales. As hypothesised by Hollis and colleagues, the study findings demonstrated that by providing clinicians with a QbTest report diagnostic decision-making accelerated, without compromising diagnostic accuracy. The graph above shows that this difference appeared early on during follow up. Clinicians with access to a QbTest report were 44% (p= 0.029) more likely to reach a diagnostic decision and the consultation time to diagnosis was reduced by 15% (p=0.001). Furthermore, clinicians were twice as likely to rule out ADHD correctly early in the assessment process, and 77% (p=0.022) more confident in their diagnostic decision. The AQUA-trial demonstrates that it is possible to speed diagnosis and efficiency without compromising accuracy or patient experience. Encouragingly, not only clinicians but also families valued the QbTest for providing an objective, valid assessment of symptoms and the test was noted to facilitate communication between clinicians, families and schools. When asked, all clinicians agreed that QbTest made it easier to explain to patients why they do or do not have ADHD. The health economic analysis in the study shows that QbTest should increase patient throughput and reduce waiting times without signiﬁcant increases in overall healthcare system costs. Further evidence from the East Midlands Academic Health Science Network (EMAHSN) found that the integration of QbTest resulted in a reduction of time to diagnosis of 145 days, a release of 38% in clinical time and a 22% cost saving within multiple NHS clinics. With over 500,000 patients tested worldwide, a landmark publication from a world class research organisation and an independent real-world evaluation from the EMAHSN, QbTest has demonstrated transformative improvement in patient care and service delivery. Maybe the question for clinicians and managers of ADHD services is not anymore ‘why should we’, but rather “how soon can we” implement QbTest.